of the period . . .Roman coins. participated in the ACE coin attribution project for five years. Due to Ms.
Eruditionis award by ACE Director Scott Uhrick. coin collecting and expand the hobby. reward a good result with a coin prize too?! 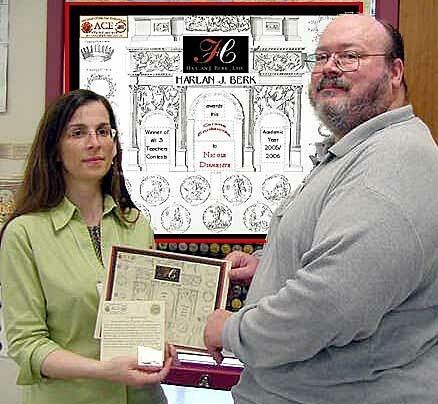 "LatinTeacher Nicole Diamente winner of 3 ACE Image contests being presented with the Harlan J. Berk "Corona Eruditionis"award by Scott Uhrick of ACE"